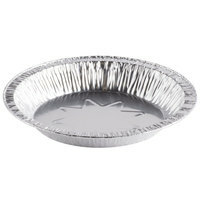 Keep up with the high demand for your famous pies with this D&W Fine Pack B41 8" foil pie pan! 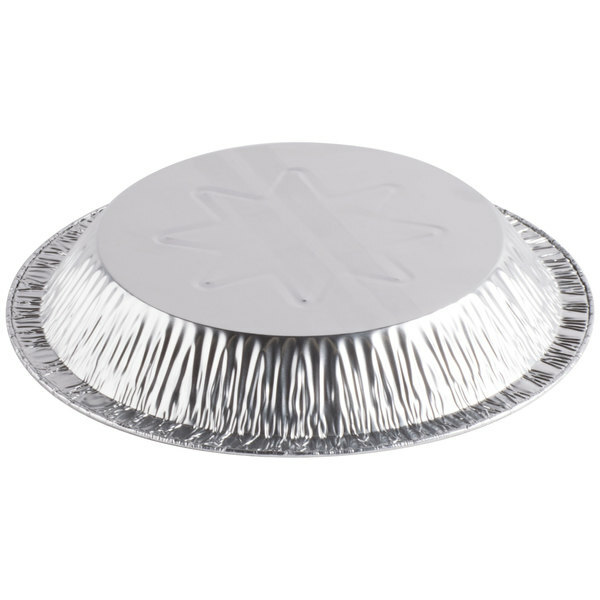 Created with efficiency in mind, this disposable item is perfect for cafes, restaurants, and other establishments that bake multiple pies per day to ensure all customer requests are being fulfilled. Since it is easily disposed of at the end of the night, cleanup is minimal and you can even send the extras home with your guests or patrons. "This is GREAT pie pan. I've been using this style/brand for many many years. I sell at least 200 pies each apple season. Highly recommend!" Its modest size gives you the opportunity to create smaller pies or meal quiches, allowing you to sell either by the piece, or by the entire pie. In addition, the 45 gauge aluminum material is strong enough to resist breaking, but flexible enough to bend to allow for easier serving. Featuring a full curl rim, this pie pan can also be used for displaying your baked goods in pie cases or countertop pie stands. 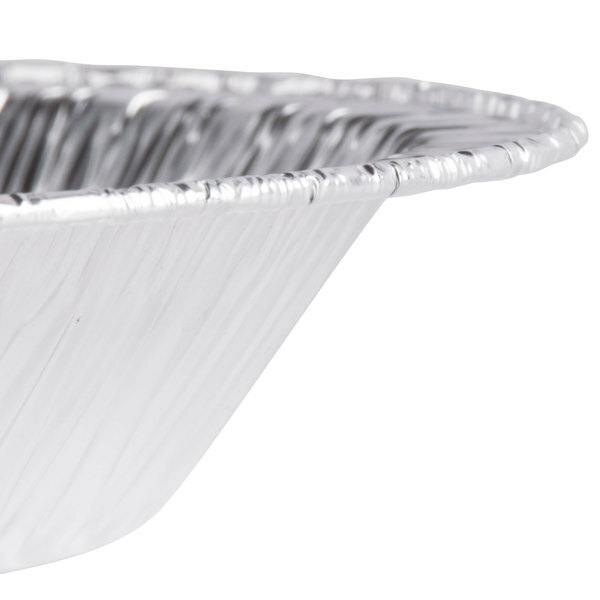 With an impressive depth of 1 1/16", this pie pan is ideal for fruit pies, pudding pies, dinner pies, or even quiches. 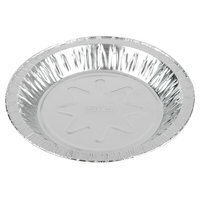 We got these with Polar Pak 3125 8" Hinged OPS Plastic Shallow Pie Container - 20/Pack #99903125... They go well together.. These pans are just the right size for our needs. I'm realizing that 8" pie pans are more popular than I previously thought. We really don't like the 9-10 inch sizes. Sometimes they are just too much. I'm finding more and more pies and desserts in our local stores in this size as well. Not too small, not too big, just right! This is a Great product that will work for all pies and desserts. Durable. They are Always in stock even if you are ordering during holidays. Great dishes for dips, sauces, mini quiches, and anything you want to make in individual portions. 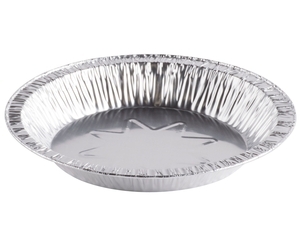 Your product will be more appealing to customers when they can take their very own mini pie instead of a slice. This is GREAT pie pan. I've been using this style/brand for many many years. I sell at least 200 pies each apple season. Highly recommend! Excellent price! Super fast shipping! 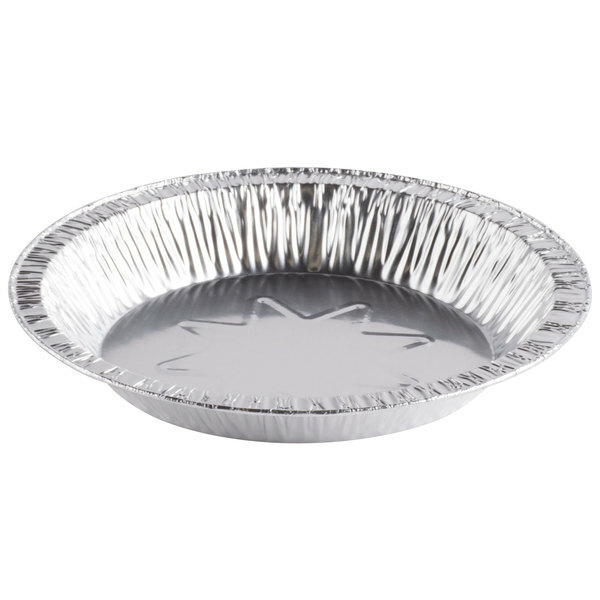 Ordered this item in bulk for a "country" theme meal where everyone received their meal in a pie pan. They loved it! Great pie pan - everything i needed for holiday orders. Very sturdy and great size - what more can you say about a pie pan! Good for baking pies that are not too loaded or heavy with finished product. Foil is not heavy duty; more like medium duty. Fits perfect into regular pie boxes. These pie pans are great for the low price. Lowest price out of all the web sites. Perfect size for pies, not to small nor too big. For just two of us, a 9" or 10" pie is just too much. We tire of it before we finish it. This makes a smaller pie that we can eat quickly and there's no waste. 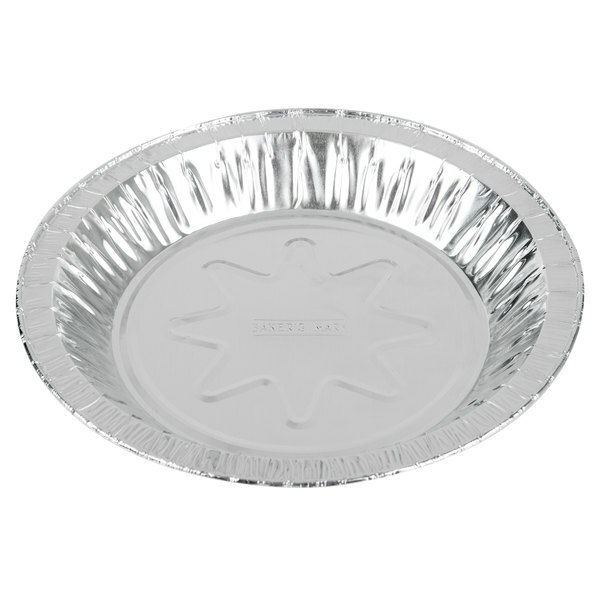 It is also wonderful for pie gifting, when combined with the lovely pie carriers available on the WebstaurantStore website. Most full-size pie recipes will make two of this size pie, so you can make one for yourself and give the other away. Or some recipes freeze well, so you'll have another for surprise guests. I also use these pie pans for toasting things in the oven (pecans, coconut) sending left overs home with someone or heating leftovers in the oven. A very versatile pie pan. 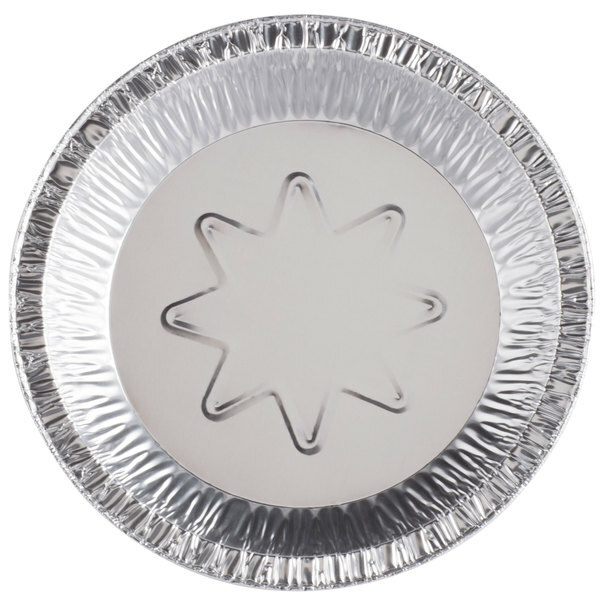 I love these 8" pie pans, they give my customers a choice for a smaller pie. They are sturdy and a nice size and always fast delivery. These pie pans make small, shallow pies. The aluminum is sufficiently sturdy compared to some other pans, and the price is good. I was satisfied with them. Sturdy and just the right size for my med. pie business. They fit nicely into the 10 x 2 1/2 cake and pie boxes, also from web restaurnt. And they are deep pans, not shallow! I bake and sell pies at Farmer's Market. 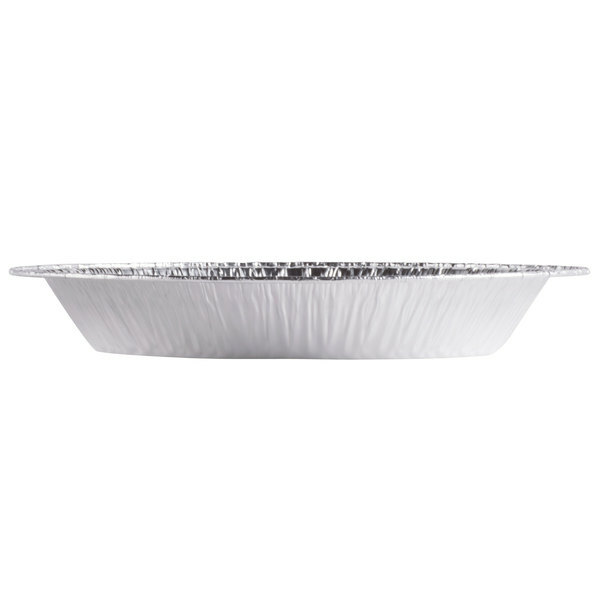 The heavy duty construction of the 8-inch Foil Pie Plate makes transporting the finished product very convenient. No one wants a pie pan so flimsy it folds like a taco shell!! Save $2.00 with our Recommended Product! Try this Baker's Mark 7 15/16" x 1 3/32" deep pie pan instead! 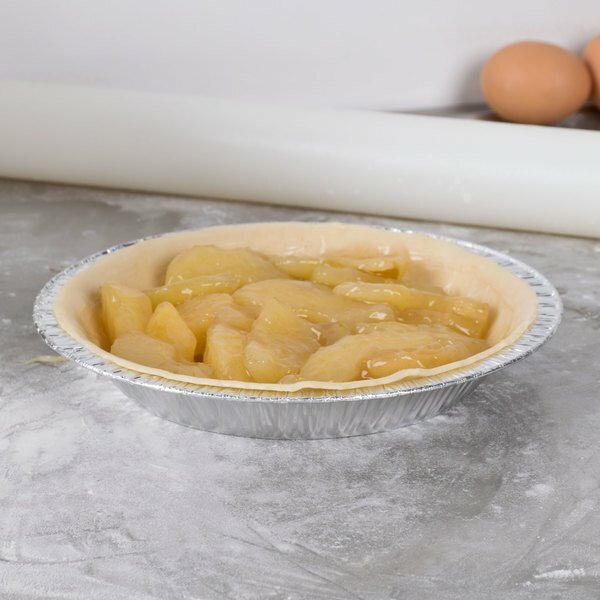 Also featuring a durable 45 gauge aluminum construction, this pie pan gives you everything that the pan you selected does, but it comes to you at a lower price. 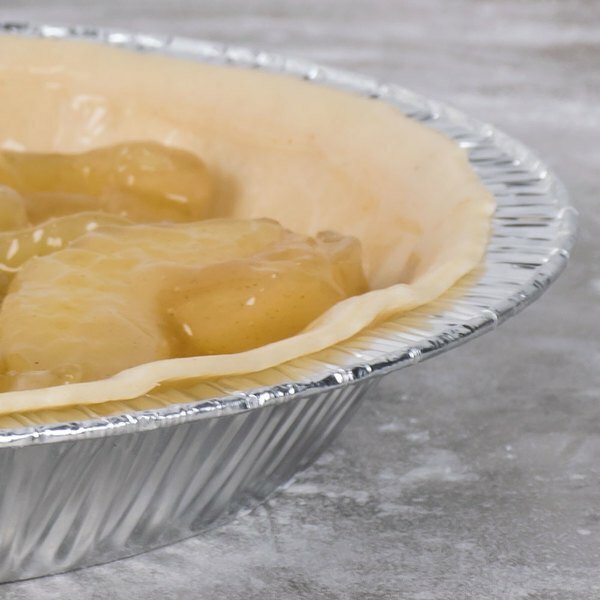 It's perfect for preparing and presenting full pies, with a convenient disposable design that's ideal for to go occasions and bakery orders.